The reusable test vehicle which had been prepared at Noshiro Testing Center was sussessfully lifted off 09:58 am October 25 by ISAS (the Institute of Space and Astronautical Science) of JAXA. It flew up to follow its planned trajectory for 17 seconds, hovered at 10 meters altitude, and landed on the scheduled plot. 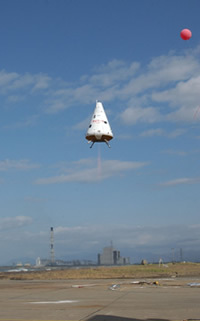 The flight test will be carried out two more times in a few days.